VMAC recently announced the H40 hydraulic air compressor is now available in a 24 V model for OEM equipment that uses a 24 V electrical system. A variation of VMAC’s H40 hydraulic air compressor, it was first built in partnership with Vancer, headquartered in Galesburg, Illinois, a company that engineers, builds, and distributes innovative maintenance-of-way (MOW) equipment for the rail industry throughout the U.S. and Canada. Vancer uses hydraulic air compressors on their excavators but were running into challenges during installation. Traditionally, installers use a converter kit to make 12 V air compressors compatible with 24 V electrical systems. These converter kits are placed between the air compressor and the power source, essentially modifying the voltage before the power reaches the air compressor. 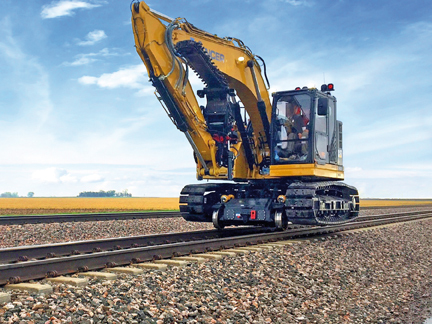 Voltage convertors work for most equipment but are complicated to install on excavators, as excavators have multiple pivot points and long wire points that need to be considered. By swapping the 12 V fan in the integrated hydraulic/compressor oil cooler with a 24 V fan and using a small internal converter for the 12 V control box, this problem is instantly eliminated. “The new 24 V hydraulic air compressor was built for 24 V electrical systems, completely eliminating the need to install a converter kit. It’s a simple improvement but it will save countless hours of work on future excavator installs,” added Mr. Duifhuis. Vancer’s new hydraulic air compressors also feature a black exterior to match the Cat® brand. The H40 is a rotary screw air compressor powered by hydraulics, which allows it to fit on equipment and vehicles with limited available space. The H40 can free up to 0.17 m3 of space and reduce weight by up to 118 kg, while providing up to 1,130 l/min of continuous air.